Creating a strategy for compensating influencers raises a number of questions. Payment can be a sensitive topic, and influencers are motivated by different things. This requires a strategy on the brand’s part to attract the best influencers who will create the highest-quality content. Here are a few steps to help you get started. Before agreeing on an amount, brands should spend ample time researching the market. Many websites offer insight into how much money a typical sponsored post goes for. Keep in mind that the amount will vary depending on the influencer’s reach and engagement, as well as how motivated the influencer is to promote your brand specifically. An influencer who already uses and loves your products is an ideal choice, and they may feel more rewarded working with you than with another brand they don’t purchase from already. Other influencers may require more compensation to sweeten the deal. Brands should offer a reasonable amount, as low offers likely won’t attract the highest quality influencers. It’s tempting for brands to offer a low-value product or the smallest placement fee they can get away with. While this may stretch the budget in the short-term, brands may get a much lower ROI due to the lower quality influencers they attract. Be as generous as you can with product and placement fees, and hold out until you find the very best fit for your brand. Don’t settle for the low-hanging fruit. For brands continuing to perfect their influencer marketing strategy, they will want to see which influencers perform the best. Combine affiliate commissions with your placement fees in order to create a win-win scenario. Offer a generous commission that makes it worthwhile for the influencer to continue to promote your products even after the sponsored post is published. The best results we’ve seen in the Marketplace are from influencers who were offered a high-value product, a substantial placement fee and competitive commissions. It’s no coincidence that the quality influencers they attracted with this compensation package also continued to drive sales long after the campaign ended. What are the average rates for sponsored posts? Brands often want to know the average rates for influencer posts. Again, paid placements will vary depending on the influencer’s reach and engagement, among many other factors. However, there are some resources we’ve found that give insight into average going rates. According to 2016 Bloglovin’ survey of 2,500 influencers, most Instagram influencers charged less than $250 per post. Most bloggers charged less than $500 per post. If an influencer initially charges significantly above these amounts, it’s worthwhile to do some extra research and make sure you aren’t overpaying. 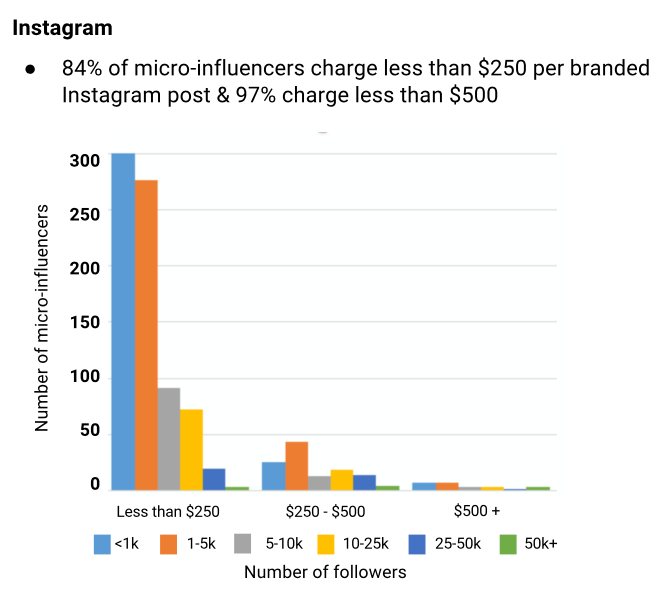 Research by Digiday confirms similar amounts for Instagram users, stating: “Langer thinks that brands can start with $250 per Instagram post for social stars with less than 50,000 followers, then add roughly $1,000 per 100,000 followers per post.” If you’re focusing on micro-influencers with under 50,000 followers, it seems that $250 is a reasonable amount. Again, keep in mind that you will likely need to increase your offerings if you’re looking to hire influencers with more reach and engagement. Now we’re ready to put all the pieces together. A brand should have a reasonable budget carved out solely for influencer marketing. They should be prepared to offer a reasonable combination of product, commissions and placement fees. This provides incentive to the influencer to drive sales, as well as the ability to track how effective your campaign was. Offering competitive compensation can go a long way with creating partnerships with influencers. Use this guide to attract the best influencers for your brand. Be sure to continue to invest in the partnership over time, as long-term relationships create the most benefit for you and the influencer.